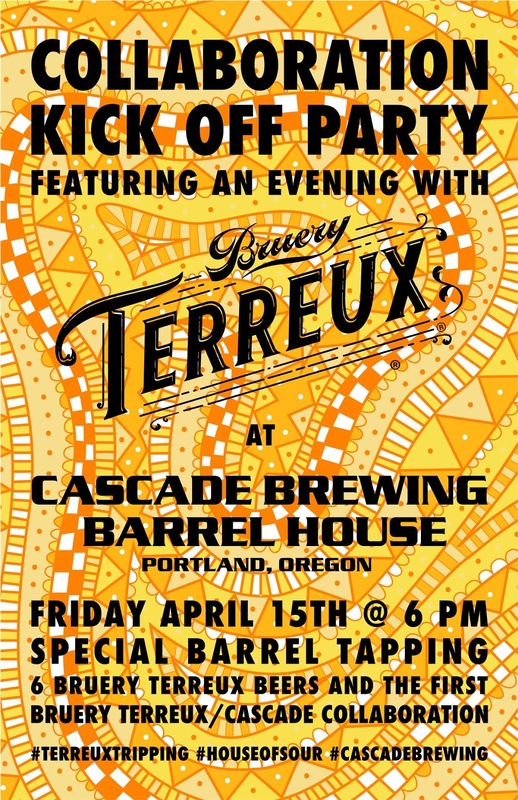 PORTLAND, Ore. – Cascade Brewing has announced a collaboration project with Bruery Terreux that will kick off with a party on Friday, April 15 at the Cascade Brewing Barrel House, 939 SE Belmont St. The event will launch with a special live barrel tapping at 6pm by brewers from Bruery Terreux; this will be followed by an evening with Bruery Terreux featuring five of the brewery’s sour beers and one non-sour (from The Bruery). Fans can look forward to tasting Filmishmish, Humulus Terreux, Oude Tart with Cherries, Sourrento, Blue BBLS and White Chocolate (the non-sour). The highlight of the lineup will be a collaboration blend with Cascade, a limited 10 gallon batch made solely for the event. 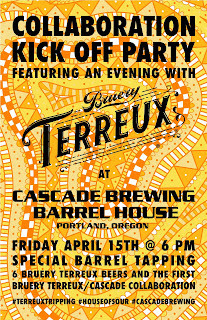 Bruery Terreux team members are traveling to Portland specifically to design a recipe with Cascade for a beer that is projected to be released in bottles by both breweries in 2017. Cascade brewers will be heading to Bruery Terreux in May to continue the collaboration process. Bruery Terreux is a boutique craft brewery located in Orange County, Calif., specializing in farmhouse-style wild and sour ales. Bruery Terreux, which loosely translates from French to “Earthy Bruery” was developed by Patrick Rue of The Bruery as a space to focus on and experiment with wild beers. While The Bruery had been creating such beers since its foundation in 2008, this new opportunity provides a dedicated space, equipment and staff to concentrate upon and go further within the process than ever before. Cascade Brewing is known for its award-winning Northwest sour ales that feature a clean, lactic acid profile produced by a house culture of lactobacillus bacteria. The beers frequently rely on the use of fresh ingredients grown exclusively in the Pacific Northwest, including as cherries, apricots, berries and grapes. Its blending house currently holds more than 1,400 French oak, Kentucky Bourbon and Northwest wine barrels – plus nine foudres (a Flemish word meaning huge oak barrel).